A ProPublica investigation of dark money organizations lends context and additional color to some of what I had to say a a short while ago about the Marquette County Road Commission’s lawsuit against the EPA. Sponsored by State Senator Tom Casperson, the Republican representing Michigan’s 38th district, the MCRC lawsuit is being funded by a non-profit organization called Stand UP. Stand UP is exactly the kind of dark money organization profiled by ProPublica: it’s a special kind of non-profit, a 501c4 “social welfare” organization that is not required by law to disclose the names of donors. It does not have to confine its fundraising and expenditures to the MCRC lawsuit or any other specific purpose. It is a trough of dark money that can serve any number of political efforts. So, as I tried to suggest in a series of posts on the MCRC complaint (here, here, here and here), while the lawsuit is nominally over a haul road that will serve both mining and timber companies, it also appears to be part of a larger, coordinated effort to sideline federal regulators, stifle local environmental watchdogs, and arrogate the authority and power to direct economic development in the Upper Peninsula to a set of undisclosed actors and moneyed interests. Get the debate to focus on an “average Joe,” not a wealthy person. Find examples of “inconsequential donation amounts.” Point out that naming donors would be a threat to “innocents,” including their children, families and co-workers. And never call it dark money. “Private giving” sounds better. They urge dark money groups to claim the victim’s mantle and to see conservatives as “a persecuted class,” according to one January 2016 memo Faturechi uncovered. It’s “all part of a plan to choke off our air supply of funding,” they warn. The documents presented by Faturechi were distributed at a conference held in Grand Rapids by The State Policy Network. The Network “calls pro-regulation activists ‘enemies of debate,’” and generally takes the line that regulation quashes freedom and criminalizes belief — a refrain often heard from climate change denialists — and that transparency will only threaten privacy. The State Policy Network brings together conservative and tea-party organizations from around the country dedicated to “advancing freedom and making a difference,” so it’s well positioned to coordinate local efforts like the MCRC lawsuit against the EPA with other state, regional and national causes. In Michigan, the Network’s member organization is the Mackinac Center for Public Policy. Just last week, they ran a widely shared update (303 “likes” and counting) on the MCRC lawsuit in which Casperson crows about the progress they’ve made in the discovery phase of the suit and wails about prejudicial treatment at the EPA. This entry was posted in Business and Society, Lake Superior, Louis V. Galdieri's Blog, Prosperity and tagged campaign finance, corporate political activity, corruption, dark money, disclosure, Environmental Protection Agency, EPA, ethics, Lake Superior, Mackinac Center for Public Policy, Marquette County Road Commission, Marquette County Road Commission v. EPA, Michigan, mining, power, ProPublica, Robert Faturechi, State Policy Network, Tom Casperson, transparancy, Upper Peninsula, Water, Yellow Dog Plains on February 15, 2016 by lvgaldieri. Michigan State Senator Tom Casperson is the most visible political figure associated with the MCRC v. EPA lawsuit, the agent if not the author of its political project. We don’t know exactly what or how much he did to encourage members of the Marquette County Road Commission to take the EPA to court, what assurances were given and what expectations were put in place, as at least some of those meetings appear to have been conducted on the down low (and in violation of the Open Meetings Act). But the Escanaba Republican has never been shy about his support for CR 595 or his hostility toward the EPA. Brian Cabell is stating what seems obvious when he links Casperson’s support for CR 595 to his business associations with timber and trucking in the Upper Peninsula, and it’s reasonable to believe that timber interests are among the donors to Stand U.P., the 501c4 dark money association funding the Road Commission’s lawsuit against the EPA. Before entering public life, Casperson succeeded his father as owner and operator of Casperson & Son Trucking, a log-trucking business started by his grandfather and based in Escanaba, Michigan. Associations like the Michigan Forest Products Council, the Great Lakes Timber Professionals and the Michigan Association of Timbermen support and celebrate the Senator’s achievements. But those relatively direct and straightforward business associations are probably not the only ones in play here, and in supporting CR 595 and encouraging the CR 595 lawsuit, Casperson appears to be doing more than a little favor for himself and his friends back home in the timber and trucking industries. While a 2013 tally of Casperson’s supporters shows — not surprisingly for a Republican politician in the UP — that Michigan mining, timber and fossil-fuel PACs have been among his biggest backers, I suspect the MCRC lawsuit will serve an even deeper and more shadowy entanglement of alliances and alignments. In parts 1, 2, and 3 of this series, I’ve described the formation of a political authority, or power bloc, that now pretends to direct economic development in the UP and decide what’s in the region’s best interests. That project is closely bound up with Casperson’s own political ambitions, and those ambitions are hardly limited to advocating for this haul road. Tom Casperson covets a seat above his current station, a role on the national stage; or at least he once coveted that bigger role, and politicians don’t often reconcile themselves to less power than they think they deserve. In 2008, Casperson ran against Bart Stupak to represent Michigan’s first district in the U.S. Congress. He made a pretty good showing, with nearly 33% of the vote against the incumbent’s 65%. With Stupak’s successor Dan Benishek announcing in March that in 2016 he’s running for a fourth term (after pledging to serve only three terms), Casperson will have to cool his heels until 2018. In the meantime, however Senator Casperson has a constructive role to play. In 2011, Senator Casperson introduced a resolution (SR-10) “to impose a moratorium on greenhouse gas, air quality, and other regulatory actions by the Environmental Protection Agency” and require the EPA to account for the cumulative economic effect of “all regulatory activity” on climate change, air quality, water use, and coal ash. He recently joined Dan Benishek in opposing the Obama administration’s modifications of the Clean Water Act as “regulatory overreach” — echoing the point urged by other conservative opponents of the rule, who lined up obediently behind mining, fossil-fuel and energy producers, big agriculture and fertilizer companies like Koch. For Tom Casperson, any and every environmental regulation poses an existential threat. Against this ever present danger, he is out to protect what he frequently calls the UP “way of life” and force a David and Goliath standoff with the federal government. “The burdensome regulations proposed by the EPA,” he said when introducing a bill calling for a halt to the regulation of wood-burning stoves, “are an overreach of government and need to be stopped to protect our way of life.” “If we don’t pay attention,” he warned in a recent interview, “we’re going to get run over here.” On that occasion, he wasn’t talking about the danger of ore trucks barreling through downtown Marquette; he was rising to the defense of barbecue grills. The barbecue resolution Casperson introduced this year with State Senator Phil Pavlov (and which passed the Michigan legislature unanimously) is an unabashed exercise in demagoguery. “Barbecues are an American tradition enjoyed by families from all walks of life across the country,” it begins, “whether tailgating for a football game, hosting a backyard get-together, or just grilling a summer meal, barbecues are a quintessentially American experience and an opportunity to eat and socialize with family and friends.” What prompted this noble defense of American tradition and the quintessentially American experience of barbecue? Of football, get togethers, and families from all walks of life across the country? Nothing much. In an EPA-sponsored competition, students at the University of California, Riverside were awarded a grant of $15,000 for proposing “to perform research and develop preventative technology that will reduce fine particulate emissions from residential barbecues.” That’s all there was to it. But those prize-winning students and their particulate emission preventing technology posed enough danger for Casperson — along with Missouri State Senator Eric Schmitt, Richard Hudson of North Carolina, Allen West and others of their ilk — to start hyperventilating about Obama and the EPA “coming after” our backyard barbecues. It looks like a loosely coordinated effort, with all the shills singing from the same sheet. It’s a common tactic used to stir up popular sentiment against the regulation of polluters: when big pesticide users don’t like a new rule clarifying which waters are protected by the Clean Water Act, the demagogues tell small farmers that even a little ditch on their property will be counted among the “Waters of the US”; when regulators take aim at the fossil-fuel industry, the demagogues make dark predictions about the end of s’mores and campfires. This is, by the way, the second time the Michigan legislature has fallen for this particular barbecue canard; the last time was back in 1997, when the Michigan House unanimously approved a resolution protecting barbecue grills against over-reaching federal bureaucrats. Casperson’s resolution was a reboot. Back in the 90s, and again in 2014 when Texas Senator Pete Olson demanded the Clean Air Act had to be amended if Texas-style barbecue were to be saved, the phony patriotism around Americans and their barbecue grills was a flag-waving effort to thwart the EPA’s proposal of stricter ozone limits. This time? Maybe rallying the troops around their barbecues helped to galvanize anti-EPA sentiment in the fight against the new Clean Water Act rule, or capitalize on the Pyrrhic victory the Supreme Court handed to industry in Michigan v. EPA. A watchdog blog notes that Casperson’s “legislative record directly reflects the money trail,” but the equally important point — the one that I want to emphasize here — is that Tom Casperson’s efforts in the Michigan legislature appear to be connected and aligned with other legislative and extra-legislative efforts to ease environmental regulation and advance extractive projects and industrial development. The MCRC complaint presents a sterling opportunity for Casperson to strengthen these connections and forge new alliances. He would be a fool to pass it up. Clark Hill, the attorneys who prepared and filed the complaint, already support Dan Benishek through their federal PAC; so Casperson may be able to jockey for a position in line behind him. But the law firm also gave more to Michigan Democrats than Republicans, and their real power and political influence does not depend on the nominal contributions they make to various political campaigns. Those are just goodwill gestures. Their political law practice, on the other hand, is a true nexus of political power, and at the head of it sits none other than Charles R. Spies. In 2012, Spies was Chief Financial Officer and Counsel for Restore our Future, the largest super PAC in history, formed to elect the unelectable Mitt Romney. Nowadays, Spies is supporting Jeb Bush, with a new Super PAC called Right to Rise. These are the big leagues — much bigger than Casperson could ever dream of playing in. But the national success of Right to Rise will depend on thousands of coordinated local and regional efforts. If the MCRC lawsuit continues to go forward, it could easily have a place in that scheme, while raising Casperson’s profile and burnishing his conservative credentials. For its part, Stand U.P. can continue to raise all the money the MCRC needs for its lawsuit and whatever other political projects Tom Casperson and his cronies may be planning, and never have to disclose the sources of those funds. Its 501c4 “public welfare” status affords that protection. This entry was posted in Business and Society, Lake Superior, Louis V. Galdieri's Blog, Prosperity and tagged 501c4, Alan West, barbecue, barbecue resolution, Bart Stupak, birther, Casperson and Son Trucking, Charles R. Spies, Clark Hill, Clean Water Act, corruption, CR 595, Dan Benishek, demagogue, demagoguery, Environmental Protection Agency, EPA, Eric Schmitt, Escanaba, fossil-fuels, Lake Superior, Lundin Mining, Marquette, Marquette County Road Commission, Marquette County Road Commission v. EPA, MCRC v. EPA, Michigan v. EPA, mining, oil, political authority, political power, politics, pollution, power, Republican, Republicans, Richard Hudson, Right to Rise, shills, Stand U.P., timber, Tom Casperson, trucking, UC Riverside, Upper Peninsula, Water, water pollution, Waters of the United States on August 17, 2015 by lvgaldieri. In this Greg Peterson photo from the Cedar Tree Institute site, Northern Great Lakes Synod Lutheran Bishop Thomas A. Skrenes blesses one of the trees faith congregations planted on Earth Day, 2009. As I suggested in my first post in this series on MCRC v. EPA, the complaint filed by the Marquette County Road Commission would have us believe that “anti-mining” forces worked secretly with and even infiltrated the EPA, and the agency’s objections to CR 595 followed a “predetermined plan.” The EPA, it claims, had decided to oppose the haul road even before the MCRC application was reviewed. This sounds like legitimate cause for concern: permit applications should be reviewed on their merits, not pre-judged and not according to some other anti- or pro- agenda. We certainly wouldn’t want someone in the Environmental Protection Agency to be “pro-mining”; there are enough well-paid mining lobbyists already haunting the hallways in Lansing and Washington, DC. But in this case, the anti-mining label is being used as a term of opprobrium, and to distort and deliberately misrepresent what the Environmental Protection Agency is chartered and required by law to do: in short, to enforce the Clean Water Act and protect the environment. When it comes to proving the insinuations it makes, the MCRC complaint offers slim evidence. For example, the complaint makes a big fuss over a November 28, 2012 letter from Laura Farwell, who lives in the Marquette area and is described here as “a prominent environmental activist.” The letter is addressed to Lynn Abramson, then a Senior Legislative Assistant for Senator Barbara Boxer, and Thomas Fox, Senior Counsel of the Senate Environmental and Public Works Committee, asking them to “weigh-in” with the EPA on CR 595. (Exhibit 1). EPA must determine whether to uphold its original objections to proposed County Road 595 under Section 404 of the Clean Water Act (“CWA”), pursuant to its supervisory authority over Michigan’s delegated wetlands permitting program. Tom may remember that during the August 30, 2011 meeting at EPA Denise Keehner of EPA’s office of Wetlands, Oceans and Watersheds definitively reiterated EPA’s position and stated that the haul road would not happen. Thus, this letter is to request, respectfully, that you weigh-in as soon as possible with the EPA on its decision. on August 30, 2011, a very different type of meeting regarding CR 595 took place at USEPA Headquarters in Washington, DC. MCRC was neither invited to nor informed of the meeting. In attendance (as far as is known at the present time) were top USEPA officials, Congressional staff, KBIC representatives, and a prominent environmental activist opposed to the construction of CR 595. It further appears that USEPA made no formal record of the meeting. Without a formal record, it’s impossible to know what transpired at this meeting, and if the complaint is going to rely on Farwell’s memory of the conversation, then it should also take into account her intentions in paraphrasing and recounting it, one year after it took place. The language here — “a very different type of meeting,” “neither invited nor informed,” “as far as is known at the present time,” “no formal record” — doesn’t help in that regard, and it’s meant to suggest that conjurations were already afoot. It’s clear the MCRC was not included in some discussions at EPA. There’s nothing extraordinary or illicit about that. All concerned parties had been meeting with and petitioning the EPA for several years at this point. The complaint is still a long way from proving that the EPA “surreptitiously met with a number of environmental activists vocally opposed to the road,” and an even longer way from proving that there was anything like an anti-mining coalition assembled in secret at the offices of the EPA. In an ironic twist, these allegations of secrecy and whispering behind closed doors may come back to haunt the MCRC: at a Marquette County Board of Commissioners meeting this month, the Marquette County Road Commission itself faced accusations that it had violated the Open Meetings Act in planning to bring its suit against the EPA. Public officials who intentionally violate that act are ordinarily fined and incur other liabilities; in this case, there would be some eating of words as well. By November 28, 2012, the EPA had, in fact, “decided against the proposed haul road,” as Farwell puts it in the email she sent along with the letter to Abramson and Fox. The EPA had entered objections to the Woodland Road Application (in March, 2010) and announced their objections to CR 595 (in March, 2012). Even so, a Fall 2012 public meeting held by the EPA “in Marquette…for more input” had Farwell worried. She was not at all confident the EPA would uphold its original objections to the haul road. The matter was still far from being “definitively” settled. Whatever reassurances Farwell was given at that 2011 meeting — or thought she had been given, or recalled having been given, one year later — were clearly at risk of getting lost in the bureaucratic shuffle. The purpose of her letter is to prevent that. There is nothing surprising in all this. Those watching new mining developments in the Upper Peninsula are constantly having to chase after the EPA and demand that the regulator step in and do its job. Jeffery Loman, a member of the Keweenaw Bay Indian Community and a former federal regulator, has repeatedly put the EPA on notice and complained of the agency’s failure to enforce the Clean Water Act. In May of this year, the grassroots environmental group Save the Wild UP filed a petition with the EPA’s Environmental Appeals Board, arguing that Eagle Mine was issued the wrong regulatory permit. The appeal requested that the EPA require Eagle Mine to obtain a Clean Water Act permit in order to protect the Salmon Trout River and other surface waters from the discharge of mining effluent. The Appeals Board did not contest the facts put forward in the petition, but dismissed it for lack of jurisdiction. They hardly proved themselves to be staunch allies. So watchdogs and environmental groups, too, have reason to gripe about the EPA and often feel powerless in the face of bureaucratic inertia and ineptitude. Laura Farwell herself seems to have felt that way, and that’s why we find her asking Abramson and Fox for help. The MCRC complaint exaggerates her influence at the EPA when it describes her as “a prominent environmental activist.” The epithet is used here to create the misleading impression that within the offices of EPA Region 5 and the confines of Marquette County there are political opponents with resources to match the power of multi-billion dollar, multinational mining companies. Laura Farwell and her husband Frank moved to the area in 2006 from Madison, Wisconsin. They are members of the St. Paul Episcopal Church and participate, along with their son Cody, in the church’s Earth Day tree plantings. The couple donated some money to the UP Land Conservancy. Farwell has also organized events for the Cedar Tree Institute, which works to bridge “faith communities and environmental groups.” (She is described on the Institute’s site as “a concerned mother and local citizen.”) She is thanked for “working quietly behind the scenes” in a 2011 Earth Keeper TV video on the environmental risks posed by the Eagle Mine; and she’s copied along with many other local citizens in a Google Group post dated April 9, 2012, urging people to comment on CR 595 before the public comment period is closed. Farwell’s commitments to land conservation are pretty clear, and while the complaint asks us to recoil in horror at the phrase “prominent environmental activist,” cooler heads are just as likely to be impressed by Farwell’s dedication to the people around her and the place where she lives. Maybe that dedication is all it takes to be a prominent environmental activist in the view of the Marquette County Road Commission. Farwell’s letter tries to create some urgency around the CR 595 issue by putting the road in context and specifying whose interests would be served by the industrializing of the region. A serious assessment of CR 595 would significantly widen the lens, taking into account the cumulative effects of all the new mining activities around Lake Superior: all leasing, exploration, development and active mining throughout northern Michigan, Wisconsin, Minnesota and Ontario. Otherwise, we miss the big picture, and without that perspective, it’s just too easy to parcel out the land, the water, and the future of the region to the highest bidders. The MCRC complaint, too, places CR 595 in the context of “mining and economic development in the Great Lakes region” in a few places, but only to make the specious argument that those who oppose or question the road are opposed to mining and therefore opposed to the region’s prosperity. These are the ideological leaps the complaint makes. Those who don’t make these leaps are called activists or anti-mining obstructionists. That is a political, not a legal argument. It’s never too late to have a serious discussion of what sustainable economic development and true prosperity for the Great Lakes region might look like. How might we best organize our lives together in this place? is a fundamental political question. But at this juncture, it appears, the MCRC can’t afford to let that conversation happen. This lawsuit is an attempt to shut it down and stifle dissent. Where business leads, society must obediently follow. To question this order of things, as Laura Farwell seems to have repeatedly done, quietly, behind the scenes, is to commit some kind of nefarious act. This is where the attitude on display in this complaint gets worrisome. With this lawsuit, the MCRC pretends to have the political authority to direct economic development in the region (not just to build and repair roads). But that is only pretense, and things in Marquette County are not as they appear. The public still does not know who is funding the Road Commission lawsuit, what they stand for and what they expect in return for their support. The real powers lurk behind the scenes. This entry was posted in Business and Society, Lake Superior, Louis V. Galdieri's Blog, Prosperity and tagged 501c4, anti-mining, Bill McKibben, Cedar Tree Institute, Clean Water Act, corporate political activity, corruption, County Road 595, CR 595, Eagle Mine, Earth Day, environmental ethics, environmental politics, environmentalism, EPA, George Monbiot, Jeffery Loman, Laura Farwell, Lundin Mining, Lynn Abramson, Marquette County, Marquette County Road Commission, Marquette County Road Commission v. EPA, MCRC v. EPA, mining, Naomi Klein, Open Meetings Act, political authority, politics, power, Save the Wild UP, secrecy, Stand U.P., Thomas Fox, Tom Casperson, Water on July 23, 2015 by lvgaldieri. Ore trucks from Lundin Mining’s Eagle Mine make their way down the Triple A road. I’ve just gotten around to reading the complaint filed on July 8th in the U.S. District Court for the Western District of Michigan, Northern Division, by the Marquette County Road Commission against the EPA. The complaint alleges that the EPA’s repeated objections to County Road 595 — that the road will threaten and destroy wetlands, streams and protected wildlife in its way — are “arbitrary and capricious” and in violation of Section 404(J) of the Clean Water Act. The Road Commission asks the court to set aside the EPA’s Final Decision against the building of County Road 595, restore Michigan Department of Environmental Quality’s authority to permit the road, and bar the EPA from further interference in the matter. While it may take the court some time to decide whether MCRC v. EPA has any legal merit, the complaint is written to serve other ends as well: political objectives. The complaint is aligned with efforts in Michigan, Wisconsin and elsewhere, to ease regulations, subvert the legal authority of the EPA and whip up anger against the federal government; and the plaintiffs appear to be connected, through their attorneys, to one of the most powerful Republican party fundraisers and a network of ultra-wealthy political donors. The MCRC complaint directs ire against a familiar cadre of enemies — environmental “activists,” overreaching federal bureaucrats and the area’s indigenous community; and it pretends to discover a dark conspiracy, in which these groups meet “surreptitiously,” write “sarcastically” about mining interests, and collude to block economic development. In fact, it’s often hard to decide whether the arguments and evidence assembled in this complaint are meant to serve as legal fodder or support political posturing. So I thought I would try to sort through them in a short series of posts on the CR 595 lawsuit. There is the tiresome pretense throughout the complaint that CR 595 would serve as something other than a haul route from the Eagle Mine to the Humboldt Mill, and that the road will benefit the public as much as the mining company. While the mining company says it is committed to making do with current infrastructure, the public clearly deserves some relief: trucks hauling ore on a makeshift route from Eagle have already been involved in a few scary accidents, and it remains a question whether cars can safely share the same road, especially an icy winter road, with ore trucks trying to beat the clock. 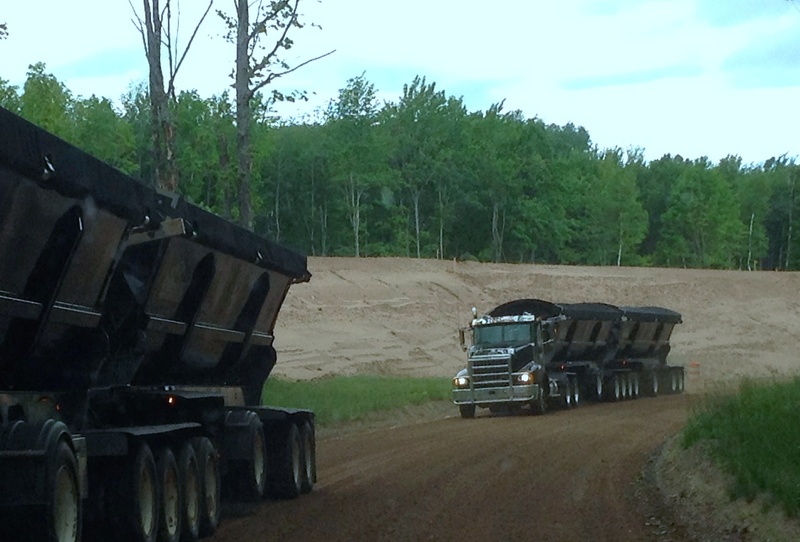 People are understandably concerned, too, about big trucks loaded with sulfide ore barreling through the city of Marquette. The public has another cause for grievance, and it makes for some angry foot stomping in the complaint: the MCRC spent millions to prepare for EPA reviews of the CR 595 application and failed repeatedly to win approval. Both time and money were wasted, the complaint says, not due to incompetence, stubbornness or denial, but because the EPA was never going to give the Road Commission a fair hearing. It’s in this connection that the complaint tries to lay out an “anti-mining” conspiracy between the EPA and environmental activists and the indigenous community in the Great Lakes Basin, and where the arguments become specious and contorted. In subsequent posts I’ll address some of the ways MCRC v. EPA constructs this anti-mining strawman in order to mount a political offensive; and throughout this series, I’m going to be asking whether the “anti-mining” label correctly characterizes the evidence brought by the MCRC. I think it’s fair to say from the outset that it does not accurately represent the priorities and commitments of people and groups concerned about the construction of CR 595. It’s reductive, and turns road skeptics into industry opponents. To be against this particular haul road — or hold its planners to the letter of the law — is not necessarily to pit yourself against the entire mining industry. The anti-mining label deliberately confuses haul-road opposition with opposition to the mining industry in order to coerce people into going along with the haul road or risk losing their livelihood, or at least the jobs and economic prosperity promised when mining projects are pitched. The MCRC complaint goes even further: it conflates mining with economic development — or reduces all economic development in the region to mining — and so runs roughshod over the thoughtful arguments of people like Thomas M. Power, who has studied the ways mining can restrict and quash sustainable economic development. The anti-mining label fences ordinary people in, distorts and exaggerates their legitimate concerns, and does not recognize that people might come to the CR 595 discussion from all different places. Most don’t arrive as members of some anti-industry coalition; they are fishermen, residents, property owners, teachers, hunters, parents, hikers, snowmobilers, birdwatchers, loggers, parishioners, kayakers, merchants, and so on. Some are many of these things all at once. The label is fundamentally disrespectful: it refuses to meet people on their own terms and fails to ask what any of the people who oppose CR 595 actually stand for. What do they want for the area? What do they value and love? What do they envision for the future? Where do they have shared interests? Where do they have real differences? How can we work together? The anti-mining label forecloses all those questions. Instead, people are divided. The label demands that everybody take one side or the other (and, as I learned in the course of my work on 1913 Massacre, in the Upper Peninsula that demand has deep historical roots in the labor conflicts of the early twentieth century; but, no worries, in this series of posts I’ll try to stay focused on the present). I have always had trouble with the idea that “anti-” and “pro-” mining positions should govern the way we talk about the environmental regulation of mining. I myself can easily slip into this way of talking. But as I tried to explain in an exchange on this blog with Dan Blondeau of Eagle Mine, that way of thinking impedes and short-circuits important conversations about the ethics of mining. Playing the anti-mining card reduces the questions of whether and how mining can be done responsibly — in this place, by that company, at this time — to mere pro and contra. It’s a dangerous ruse: instead of identifying risks and addressing responsibilities, it generates social conflict. This entry was posted in Business and Society, Lake Superior, Prosperity and tagged 1913 Massacre, anti-mining, business, Clean Water Act, Clean Water Rule, Club for Growth, coercion, copper mining, corporate social responsibility, corruption, County Road 595, CR 595, Dan Blondeau, Eagle Mine, environmental ethics, environmental politics, Environmental Protection Agency, EPA, ethics of mining., freshwater, Great Lakes, Lake Superior, Lundin Mining, Marquette, Marquette County Road Commission, Marquette County Road Commission v. EPA, MCRC v. EPA, MDEQ, Michigan Department of Environmental Quality, mining, mining ethics, nickel mining, ore trucks, politics, pro-mining, right wing politics, Section 404, social conflict, social responsibility, Upper Peninsula, Water, Watershed on July 22, 2015 by lvgaldieri. This week, the Michigan Senate unanimously passed a resolution brought to the floor by Senator Tom Casperson, who represents the 38th district. Senate Resolution 27 declares an official day to commemorate mining in Michigan. Mining Day will fall on September 6th. It’s clever to create a holiday for mining on 9/06 — the area code of the Upper Peninsula. But it’s also a little strange that the holiday will fall on a Sunday in its inaugural year (so much for sabbath and the respite it promises from the workaday world). Labor Day falls on the 7th of this year, and on the 5th in 2016; so maybe Mining Day will help put the focus on the Upper Peninsula’s archetypal laborer, the miner. But as the text of the resolution never even uses the word “miner,” “worker,” “labor” or “laborer,” and notes only in passing that mining in the UP “attracted immigrants from around the world,” it might be a little hasty or naive to conclude this measure is being taken to honor the working men and women of the region. Casperson himself promotes Mining Day as a day to recognize the role of mining “in the settling of Michigan’s Upper Peninsula” and as a “way of life” characteristic of the region, and in a press release, he added that the day would also be an opportunity to “celebrate and support responsible mining operations” in the state. So SR 27 doesn’t just look back to a bygone era of mining, but forward, positioning mining as a “growing industry” in Michigan. The adopted resolution even includes language about the “Limestone mines” in the news lately. This is not just boosterism or servile flattery. SR 28 actually serves a couple of important political functions. First, it burnishes Casperson’s legislative track record at no political cost. Down the road, he can and probably will claim some responsibility for the jobs that mining companies create in the UP. Second, SR 28 establishes legislative precedent. Casperson and others can point to this resolution and the unanimous support it received when introducing other pro-mining legislation or when confronted with challenges to mining projects already underway. Interviewed about the bill, Casperson made this explicit: “we will work to remove any remaining barriers that could inhibit the continued growth of responsible mining interests in Michigan.” No barriers to continued growth: but still, somehow, “responsible,” as if responsibility can be had without limits. Even if the EPA lawsuit fails, then, there is little to prevent Stand U.P. from becoming (unless it already is) a trough of dark money. No wonder the Senator is eager to celebrate mining’s return to the Upper Peninsula. This entry was posted in Business and Society, Lake Superior, Prosperity and tagged 501c4, Brian Cabell, corruption, County Road 595, CR595, dark money, Eagle Mine, EPA, Lake Superior, Lundin Mining, Marquette County Road Commission, Michigan, Michigan Mining Day, Michigan SR 28, mining, mining boom, Stand U.P., Tom Casperson, Upper Peninsula, Water on March 27, 2015 by lvgaldieri.